We, at Monster Man and Van, guarantee that with us you will enjoy the fastest and most efficient moving van services in North and East London. We strive to provide our clients with competitive prices and unmatched quality and we never take a day off, even on weekends and bank holidays. We from Monster Man and Van also work with dedicated packers who can prepare your items for transportation in a short amount of time using only professional packing supplies and methods. Aside of handling traditional moving jobs, we also have the required resources to carry out heavy duty removals in North East London. This means, that we have the instruments and manpower to relocate properly and effectively specialised items such as musical instruments, construction machinery, artwork, vintage furnishings, delicate office equipment and more. The only thing that you have to do to benefit from our assistance is get in touch with us and tell us when and where you need us. Over the years Monster Man and Van has managed to become the leading provider of premier quality man and van in North East London services. We have done that through extensive and very hard work. We always consider the individual requirements of the home and office relocations we have been hired for so that we can tailor a special plan to cover all the needs and personal needs of every single one of our clients. Tell us what you need us to do and leave it to us to figure out the details. Regardless of which North or East London district you are living in, we will get to you in no time. We cover that entire part of the UK capital and that is why our customers are guaranteed to get timely man and van services in North and East London for their money. But that is far from everything because we also have teams of skilled and attentive pros across the entire territory of Greater London. Every single one of our North East man and van services is tailored to be eco-friendly. We work in a green manner because we care about the environment and want to play our role for the preservation of the planet. This is why, we have adopted several eco-friendly practices such as using recyclable and reusable packing supplies, energy efficient tools, low fuel consumption vehicles and digital documentation. So if you are looking to benefit from green moving services, stop wasting valuable time and give us a call today. Apart from having a brilliant and qualified team of moving experts, we have also invested in a massive fleet of advanced moving vehicles. The trucks and vans which we use are regularly cleaned and updated. We have also installed many protection features in our transit vehicles like van ramps, moving straps, dollies and etc. Thanks to that we can provide our customers with risk-free man and van services in North and East London. We have vehicles of all sizes and each of them has a GPS tracking system and a big capacity. Hire us and we will transport all of your possessions in just one trip. Thanks to our impressive workforce capacity and our flexibility, we offer effective moving van services in North and East London that go together with premium quality and absolutely no delays. Our vetted moving van experts try to fulfil their work responsibilities as quickly as possible. Nevertheless, they always double check everything and they make sure that your furniture and other possessions are handled and moved in a correct and safe manner. In addition to precise and punctual man and van services in North East London, we can help you with other aspects of your removal in the area, including giving you a hand with packing your goods. Our expert packers and movers will use carefully crafted methods and durable removal boxes and wrapping materials, so that your goods are safe during the transportation process. Full Goods in Transit Insurance can be added as an additional safety net. Then our North East London man and van service is definitely the right choice for you. Get in touch today. One of the things that make our professional removals in North East London is that they are all facilitated by fully trained and highly experienced moving professionals. We have reliable and dedicated teams of movers all over the capital’s northeast region. Each of our trusted movers has access to specialised moving equipment and they can be trusted with the execution of a vast selection of removal jobs. That is because we have thoroughly screened all of our current employees before hiring them. As a result, Monster Man and Van can guarantee that you will be served by friendly and courteous movers who have an eye for detail and are always very motivated. Whenever you need a moving tip, our diligent staff will share their professional opinion with you. Our speedy removal services in North East London are quite comprehensive not only because we have an impressive capacity but also because our certified moving specialists have a long list of practical skills that vary from the loading and unloading of heavy furniture to the packing of oddly shaped personal possessions. We from Monster Man and Van assure you that your belongings will be in experienced and safe hands since our personnel do their job with great care, meticulousness and precision which is why our effective moving services in North East London are so great. We also have at our disposal a team of skilled and accomplished sanitation specialists with the aid of which we can provide your end of tenancy cleaning services in North East London. This way, you can delegate to us both the execution of your pending relocation and the completion of your end of lease sanitation duties. Use both of our services and we will make a special discount. We can also organise effective rubbish removals in North and East London. Our specialised and fully serviced rubbish vehicles are insured and our team of friendly waste collectors is certified. Therefore, there is simply no reason why you shouldn’t book us. Similar to our convenient man and van in North and East London, our junk removal services are can be easily individualised. You can use them independently or you can combine them. Whatever you decide, we are ready to assist you. If you are planning to move to areas like Islington, Kings Cross or Stratford, you may need a North and East London transport guide. That is because the city’s northern and eastern public transport systems are very well developed, especially when it comes to Underground services. In many ways, the English capital’s public transport network north of the Thames has a greater scope than that in South London. That is mainly due to the fact that, in the past, the northern part of the city was more heavily populated compared to the areas in the south. The districts which are set north of the River Thames are also served by the North London Line of the London Overground. It links North London to areas like Richmond and Stratford. Travelling to and from East London is also quite easy. 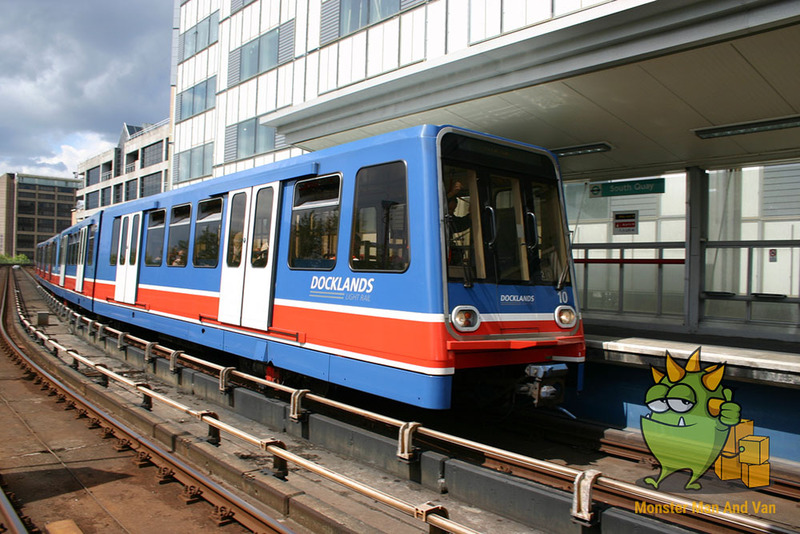 One of the most important parts of the public transport network in the city’s east is the Docklands Light Railway since it is used by 101 million people every year. The busiest DLR stations in East London include those in Canary Wharf and Canning Town. Four of the ten most heavily used tube stations are located in North and East London. The busiest of them is King’s Cross St. Pancras Underground station which has an annual ridership of more than 93.4 million passengers. Also on the list are the tube stations of Stratford (64.44 million), Canary Wharf (54.44 million) and Paddington (49.6 million). North London is really the better half of the capital to live in. Many of the original suburban districts that were developed after the arrival of the railway to London the 19th century appeared namely here. At the same time East London sustains considerable traffic as well, because it contains several really fast-growing commercial developments, the biggest among which is the former West India Docks site of Canary Wharf in Tower Hamlets. Even though North and East London both are parts of the English capital, they are more different than they are alike. North London is often viewed as being more posh, pretentious yet dull and greatly suburban in character. East London, on the other hand, has become a very artsy spot over the last few years. The common thing between North and East London is that they are both well serviced by public transport. The boroughs that are included in the territory of North and East London, are Tower Hamlet, Havering, Redbridge, Waltham Forest, Newham, Hackney, the City of London, as well as Barking and Dagenham. Out of them all, the City is ranks as the most popular commuters’ travel destination which is why there are 13 tube stations in this area alone. The busiest of them is the Liverpool Street station which is located in the ward of Bishopsgate. The North Greenwich tube station is one of the busiest rail links in North East London. The transportation hub was opened in 1999 and sits on the Jubilee Line from the London Underground network. The station provides transportation services to almost 26.5 million people on a yearly basis. The link is adjacent to the Canary Wharf tube station, which is even busier as it is used by a little less than 55 million passengers annually. As one of the leading moving firms in the capital, we at Monster Man and Van offer comprehensive and very efficient man and van services in North East London. Our trained professionals who are all licensed and very diligent know how to handle a wide range of relocation jobs around these parts of the capital with ease. Thanks to the intimate knowledge we have about the areas here, as well as the state of the art vans and equipment we employ in our day to day operations, we produce optimal results with minimal hassle, stress and strain. We do home, office and single item moving and deliveries alike. If you want safety for your goods while they are being transported, and your removal to be completed on schedule, without delays, stress and strain, then you just need to hire a man and van in North East London from our firm. Naturally, in addition to security and comfort, we can provide you with even more perks. Check up with us about our flexible schedule, competitive prices and very attractive discounts. We can guarantee you that you are going to love what you see. Join the large family of satisfied customers that our company boasts. We are looking forward to hearing from you. According to the latest statistics, there are some 1.4 million people living in the boroughs and districts of North East London. The boroughs that form this sub region of the capital are as follows: Barking and Dagenham, City of London, Havering, Newham, Redbridge, Tower Hamlets, Waltham Forest. As you can see, the North East contains some of the most important financial, residential and cultural centres of the capital at the present moment.